£24m student halls of residence scheme for AUB Student Housing starts on site. 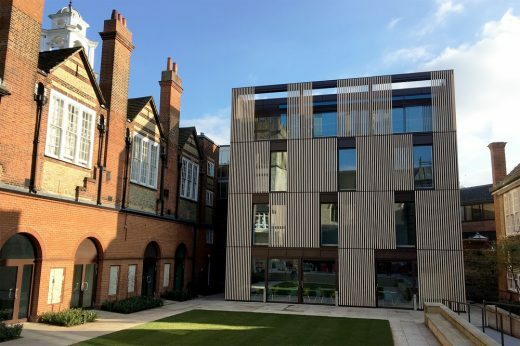 Having recently delivered award-winning projects for Radley College and Charterhouse, we continue to make strong progress on a wide range of projects for many of the UK’s leading independent schools: from sports centres to libraries, boarding houses to science buildings, we feel privileged to have the opportunity to contribute to so many wonderful educational environments. The Charterhouse School Science & Mathematics Centre has achieved practical completion ahead of its official opening in the autumn term. The School’s aim is to provide pupils with the best facilities of any school in the UK and revolutionise the way these subjects are taught at Charterhouse. The new Downe House Centre for Learning is also forging ahead, with completion of the project expected later this year. “It is my belief that this remarkable new Centre for Learning will be transformational for Downe House.” Emma McKendrick, Headmistress. 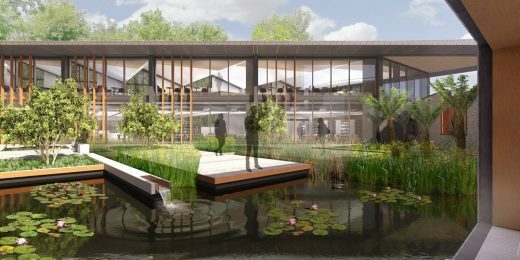 We are preparing a planning application for the new Design, Technology and Engineering Centre at Stowe School, whose aim is to provide academic and vocational training for pupils who will contribute significantly to the UK’s drive for creativity and expertise in manufacturing, product design and architecture. Our consented scheme for Winchester College’s Southern Campus represents arguably the most ambitious and wide-ranging changes to the school’s estate since its foundation by William of Wykeham in 1382. 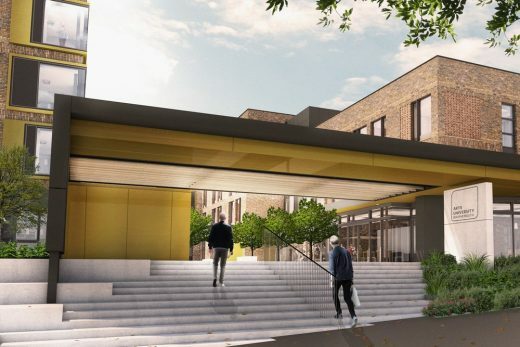 It includes the new Physical Education Centre which will create a landmark at the heart of the Southern campus; the Sports Centre will be broken into three separate ‘pavilions’ comprising the swimming pool, sports hall and the fitness suite. 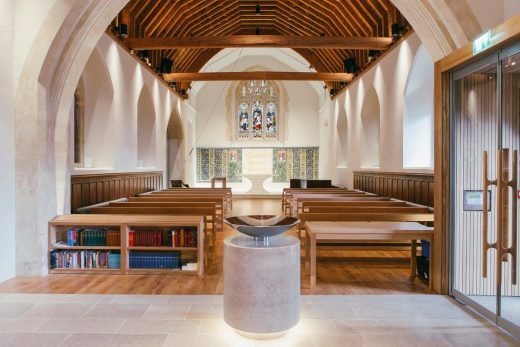 Following an invited competition earlier this year, we are now working on a number of projects for Canford School, a top independent co-educational boarding and day school in Dorset, including a new library, reconfigured assembly hall and new CCF centre. This is the first UK campus development to secure green finance. It includes a 250-seat auditorium and will increase teaching and support floor space by 20 per cent, will be completed for the 2019-2020 academic year. Architects Design Engine have won a new student accommodation project for St Peter’s College, University of Oxford following an invited competition. Shortlisted architecture practices included Allies and Morrison, Berman Guedes Stretton and Gray Baynes + Shew. One of eight buildings in the South of England chapter to have won RIBA South Awards from the Royal Institute of British Architects. 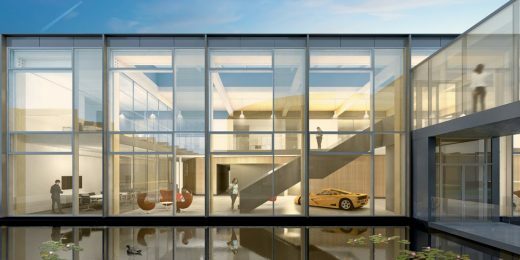 The 8,500sqm development will be located close to the existing GMD headquarters in Shalford, Surrey and will comprise 6 buildings to be constructed across three phases, with the Design & Engineering block in phase 1, main HQ and restaurant in phase 2 and the remainder to follow in phase 3. 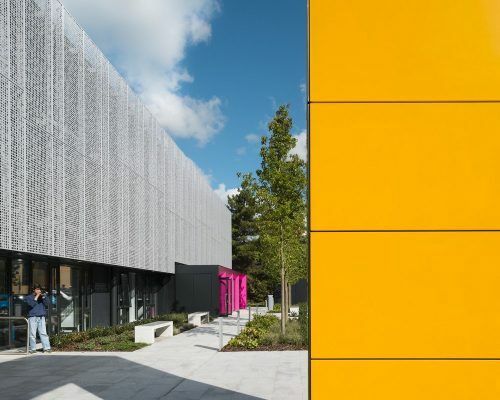 The AUB Design Workshops & Studios Conversions consist of the transformation of two former on-campus halls of residence, originally constructed in 2001, into modern studio and teaching space for Arts University Bournemouth’s internationally renowned higher education courses. The new £6.5m University Centre was won in invited competition in 2004 and represents our third project for the University of Winchester. The 3000sqm building sits on a steeply sloping site, where the natural topography of the campus is both a virtue in terms of character and a hindrance to access. The British Embassy in Sana’a was one of the first embassies to be built following the Foreign and Commonwealth Office’s review of security of their overseas network, which was prompted by the threat from international terrorism to Britain’s diplomatic missions around the world. The Embassy building is located to the north-east of the city centre in an area destined to become a new diplomatic district. 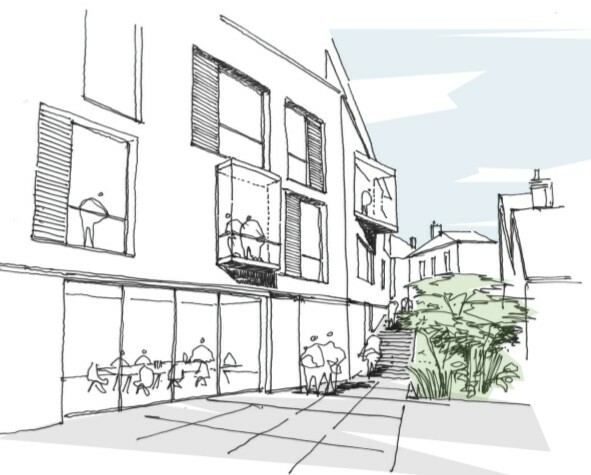 Architecture office based in Winchester, south east England. March 16, 2019 in Architects.